Q&A with Author Neal P. Gillen, "Rendezvous in Rockefeller Center"
Rendezvous in Rockefeller Center is the newest novella, play, and short story by Neal Gillen. Author of twelve books, Mr. Gillen is a longtime friend, former board vice chair and benefactor of The Writer's Center. He sponsors the McLaughlin, Esstman, Stearns First Novel Prize that highlights a new novelist and up-and-coming talent ever year. We caught up with Mr. Gillen to learn more about his new work. What we got was a true gift -- a personal look into the mind and perspective of an accomplished wordsmith. 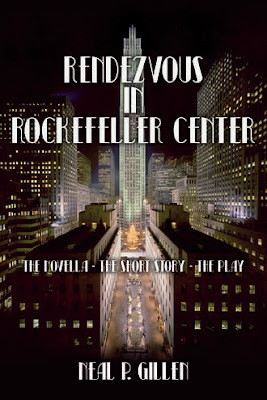 TWC: Your new story, Rendezvous at Rockefeller Center, is a novella, a short story, and a play. What brought you to sharing your story in all of those formats? Is there one you think works best? NG: First of all, I thank The Writers’ Center for its dedication to the written word and for its availability to those in the Washington DC region who have found that inner spark to tell a story, be it be theirs, that of their family, or a work of fiction that their life experience, a particular person or event, or maybe a story that has inspired them to write. 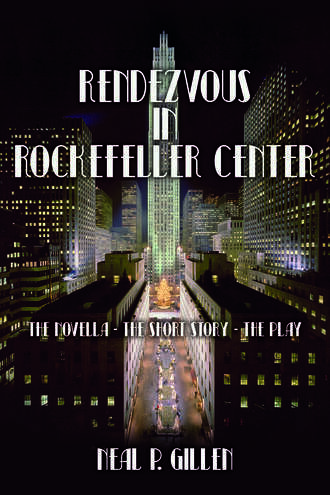 In the case of Rendezvous in Rockefeller Center, it was the experience of an old friend, considerably embellished, that motivated me to write the short story that was published by the Veteran’s Writing Project in its literary review O-Dark-Thirty. Once it was published, I heard from a number of people that they wanted to know more about the characters. After some thought, I decided to expand the story and bring out the emotions of the characters as they dealt with the complexities of their lives and their real feelings for each other after many years of separation. I had never written a play, but I felt that would be an appropriate vehicle to bring the characters to life. After four workshops with Richard Washer, I completed it and sent it around to other writers and playwrights. I ended the play leaving the audience wanting to know more, but I left it up to them to determine what that might be. The more I thought about it and as others did, including my editor, Barbara Esstman, and my wife, Mary-Margaret, I agreed that there was more to be told, especially the conflict that had to be dealt with, so I began anew and wrote the full story as a novella that ends leaving the reader wanting to know more, but as in the short story, I leave that up to the reader. As to which form I like best? I like all three forms, the short story, the play, and the novella. I found the progression of the story in each format challenging. Each is a different medium and perhaps serves a different purpose. The play is perhaps the most interesting format because as Richard Washer would say, “It’s only a blueprint.” Unlike the short story and the novella, in the play the actors will interpret the story, give it life, provide meaning, and bring out the true emotions felt by the characters. I have yet to see that, but I hope to do so. TWC: How has your writing changed from your first books to now? Where can you see that you've learned and grown? NG: I started with fast paced thrillers that became more involved with the emotions of the characters with each new story. After eight of them I completed a memoir that I had started on when I first began to write. That was a new challenge, contacting people, extensive research on events that had happened 50-years ago, bringing forth old emotions, failures and challenges. It was difficult to do. I migrated from thrillers to memoirs to short stories to where I am now. It’s an evolving process. In brief, my fiction comes from my imagination and life experiences. I grew up in a large extended Irish family in New York City in a multicultural and crowded neighborhood in the days of radio and lengthy stories at the kitchen table from aunts and uncles, the aunts having the best stories. Their stories had all the necessary arcs and conflict that moved them along. It was the same for the radio programs we listened to. You hung on every word. You could see the characters through the voice of others along with the setting, and the dialogue was priceless. And of course, the stories were all enhanced by the tellers. It was an art form that I was exposed to as a toddler. It encouraged me to read. In constructing fiction you can wing it and develop it as you move through the story letting the characters lead the way. To make it more believable, however, you have to research the subject matter. The setting for your story has to be realistic. You want the reader to feel that he or she is part of the story -- the setting will do that. You have to nail down the time frame of the story and the events of that period to put the story in its proper context. If it’s a thriller or a crime story you must either know from your personal experience or learn about police, military, CIA, FBI or foreign intelligence operational procedures. You must also know about weapons or maybe explosives. Getting the details right is critical to the credibility of your story and you as an author. In essence, fiction is a highly creative process as opposed to non-fiction, where it’s all about digging through news clippings, other books on the subject, and correspondence. It’s all about interviewing the subjects of the story or those close to it -- a constant process of getting the basics of the story together before you start writing it. It’s a difficult, tedious and a time consuming process if you are going to get it right. It’s a totally different process from fiction, where your imagination creates the story. But like fiction, you must use the facts you have assembled to put life to the characters and make the story flow. The same is true for memoirs. You have to search your mind -- get your mind to open up in a honest way. You must get at the truth. You have to search through personal and family records, diaries or date books and telephone logs (if you keep them), photo albums, correspondence, and news stories -- virtually every written thing that you can locate to help you jog your memory and to unearth concrete facts essential to your story. Your memory might be excellent, but it may be hiding something that subconsciously you don’t want to come out. You have to dig down deep even though you’re reluctant to do so. You have to contact and question others, who were there, about their recollections of your story. It involves tracking down people -- old friends, co-workers, relatives, former spouses or significant others, children, even people you might not like or haven’t talked to in years. You have to consider their memory of things -- their views on the matter at issue. And should they differ with your memory, you have to reconcile any differences. Most importantly, for the memoir to be honest and true to the story, you cannot sugar coat it. You have to forget about hurting the feelings of others or even embarrassing yourself and your family. You have to provide your reader with your true emotions and the emotions of others to make the story work. You must get at the truth. If your father was an SOB or your mother was unloving -- that’s part of the story and must be told. Told in such a way to let the reader know how you felt at the moment and how it affected you then and perhaps now. For example, were you, as a teenager, intimate with a girl who became pregnant or if the reverse is true did this intimacy result in your pregnancy? The reader wants to know your emotions when you learned of this situation as well as the other person’s emotions. Was it just your secret? How did you handle the situation? Did the parents find out? Who else knew about it? How did they react? The reader wants to know what was going through your mind and how you dealt with the situation. The same is true if someone close to you died in an unfortunate accident or was murdered. Perhaps a parent or spouse walked out on you. Maybe you were homeless. How did that affect you and the friends and family of the deceased? Memoirs are rife with emotions. Few people’s lives are a bed of roses, and should that be the case, no one wants to read about it. Readers want to know about the thorns in the rosebush. We have all known good and bad times in our lives. We have all been tested. The reader wants to know how you passed or maybe failed that test. They want to know how you became who you are. Summing it all up, I have written fiction and memoir. It’s a different discipline with memoir being the more difficult in my view. TWC: What are the most compelling characteristics about the main character(s) in Rendezvous? How do you bring them to life in the story as part of your craft? NG: The strength of the female character is most compelling. The story uncoils the mysteries of life, love, and lost opportunity. She is a rock who nurtured a young man unsure of himself only to have him abandon her and take flight into the military and lead an indifferent and insecure life. He acquires wealth, but is unfulfilled. She moves on in life, raises a daughter and starts a successful business. Her life has meaning and purpose, but deep down there is an emptiness. By chance, some 35-years later, they Rendezvous in Rockefeller Center, where in their tense and revealing meeting she repurposes their relationship and changes his life for the better. Simply put, she’s strong, he’s weak but basically good but unmoored and still seeking direction. Her revelation and strength begins to finally get him there. TWC: When did you know you were a writer? What really "flipped the switch" for you? NG: Reading two books a week for most of my adult life convinced me that I could do this. As a lawyer, I was always writing, but it was a different style: state the issues, explain them, and summarize why your argument should prevail. It was brief and to the point. I knew that I could do it, but I needed guidance from others. The Writers’ Center provided that along with introducing me to a legion of capable writers who were willing to offer advice about the basics of telling a story. I had the stories. What I lacked was the techniques to tell those stories. TWC: What advice do you have for budding writers? Anything to share with established writers? NG: Anyone reading this obviously has an interest in writing. To those budding writers I would say, keep at it, don’t be discouraged, follow your gut, take your time to get it right, and ask for advice. To established writers I would say what they already know, that the times and the methodologies of publishing and marketing are no longer subtle, they are changing at warp speed and you have to adapt to that change. TWC: What is the most underestimated component of a short story? What makes or breaks it for you? a daunting task. Driving the story from the beginning is perhaps the underestimated component. Another factor is how you resolve the conflict. On the other hand, as I did in the Rendezvous in Rockefeller Center short story, you can leave it to the reader to resolve it. I cannot define what makes it or breaks it for me, be it the traits of the characters or the plot or theme of the story. I get an idea and I begin to write. I may get it right in one shot, or I might stop and wonder why it’s not working. Who can tell on any given day? It’s a process that’s not always satisfactory, but when it clicks, nothing is more intellectually rewarding than to know that you have created a story. TWC: How do you write good dialogue? What's the secret? NG: I was raised in a verbal society, so that has never been a problem for me. Dialogue is listening to or having a conversation. I put myself in the shoes of the characters and the emotions of the moment and it usually flows. TWC: You weren't always a writer. You're a veteran and have worked all over the country. How has your life experience shaped your writing? How could a new writer conceptualize of their life as an augmentation to their stories? NG: True, I’ve lived a full and well-travelled life, had a successful career, served in the Navy, and have a wonderful family, but it is through my reading that I have learned to write. The life experiences expose you to situations and people that make for good stories. If you haven’t been anywhere or lived that long, then write about that place and the people you have met in your life where you’re from. You can take ordinary lives and create an interesting story, be it in a farming community, a fishing village, or a small university town. A lot goes on behind closed doors and there is always conflict within a household or a community as well as rich characters waiting to be defined. TWC: Where can we find your book?